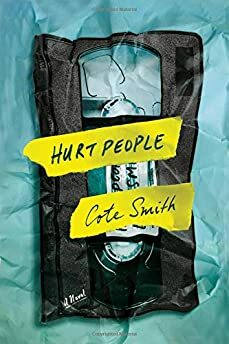 Largehearted Boy: Book Notes - Cote Smith "Hurt People"
Book Notes - Cote Smith "Hurt People"
Cote Smith's Hurt People is a marvelously unsettling debut novel. "Writing with extraordinary grace and tenderness, Smith injects unnerving tension into a delicate coming-of-age story set squarely in the path of a tornado." I don't listen to music while I write. I get too distracted. That said, as I was writing Hurt People, there were several songs that helped me think about the characters, who they were and where they were going (or not going). Here are some songs that did just that, and made me believe that the pain my characters were feeling and inflicting on one another is in some ways universal. My brother Brett put this song on a birthday mix he made for me when I turned 26, which is around the time I first started writing my novel. I think he was living in Brooklyn at the time, while I, along with the rest of his family and friends, were in Kansas. This song beautifully conveys the emotional and physical distance we were both probably feeling then, as well as the sorrow felt by the young narrator of Hurt People as he watches his family drift apart. A song, that, like Hurt People, is told from the perspective of a child whose mother maybe doesn't have her priorities straight. I particularly like the lines about how when the mother "had a boyfriend for some while," the narrator busies himself watching tapes on a VCR, and that he somehow "grew up in spite of it." Very fitting for the setting and context of Hurt People, which takes place in the late 80s. Another great family-themed song. It works well for the older brother in Hurt People, with lines like "I wonder which brother is better / which one our parents loved the most / I sure did get in lots of trouble / they seemed to let the other go." But the song could just as easily be told from the perspective of the father in the novel, who, like the singer, wants his family to know he loves them, no matter what has happened in the past, or what the future will carry. While I don't listen to music while I write, there are certain songs I occasionally use to pump me up to write. This is one of those songs. Very anthemic. I get goosebumps around the 2:40 mark every time. And the lyrics in the first verse, "Can you see the blood on my sleeve? / I have fallen in the forest / Did you hear me?" would make for a pretty good epigraph for the novel. A good setting song. The opening lines captures a bleak city filled with cracked sidewalks and broken buildings, not unlike the setting of Hurt People: Leavenworth, Kansas. Leavenworth is a prison town as flawed as the characters in the book, but it's also all the brothers know. It's home. The tempo and beat make you want to dance, but the song's story of two brothers who left behind a troubled life, trying to disappear, should give you pause. It's a deceptively disturbing song about two brothers inflicting as much pain on one another as possible. The family in Hurt People feels like that sometimes. I think all families do. I like how Cat Power strips this Velvet Underground song to its bare bones, showing how much we matter to one another, and how one person's infinite faith in another can be reason enough for both of them to carry on. The narrator of Hurt People has a similar faith in the people he cares about, especially his older brother, who he idolizes. In the novel, the mother has a list of expressions she frequently throws at the two brothers, including a cliche that gives the book its title. You are what you love could be one of those sayings. When Jenny Lewis sings "you are what you love, and not what loves you back," I am reminded that often times we are defined not by the feelings we share with the people we care about, but by the instances in which those feelings aren't returned. More hype music. Chance goes on some great lyric runs that are fun and inspiring. Writing is very difficult for me, but this song is a good reminder that it's OK to have fun making art. As someone who majored in Classical Languages, I geek out anytime I have a chance to put that knowledge to use. Here, the chorus references the founding of Rome by Romulus and Remus, who were raised by a she-wolf after they were abandoned. This song uses that myth in so many meaningful ways, all of which suit the family in Hurt People. Perhaps most striking is the idea that after the wolf mother leaves the brothers, things begin to fall apart. In the final verse, when the speaker of the song screams the revenge he plans to exact on the world, you can feel how much pain he has inside him, and how desperately he wants to share that pain with everyone around him.